Why does MBAM Premium trial version classify the BlockSite add-on is a PUP? Is that add-on really harmful or is MBAM being overcautious? I asked MBAM tech support. I got a reply from a joker named Maurice who sent me pages of irrelevant copy-pasted blabber, among other things suggesting that I download and install and run a certain diagnostic tool. That is ludicrous. All I wanted was an answer to a simple question: is the Firefox add-on named BlockSite harmful or not? I meant "classify the BlockSite add-on as a PUP". Is there no way to edit here? Your topic/issues have been escalated to Malwarebytes' management. 1) Are you referring to BlockSite, BlockSite Plus, or another, similarly named Firefox extension???? 2) It might also help if you could please attach a TXT version of the MBAM scan showing the detection to your next reply in this thread (let us know if you need help finding, exporting or attaching the txt file). 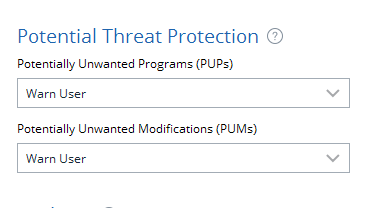 Also, there is more information about PUPs here: What are the 'PUP' detections, are they threats, and should they be deleted? If you have a file (PUP or other executable or file) that you think is being falsely detected as a PUP, then there is a special forum section reserved for reporting this. If you wish to do so, I suggest starting with the instructions here and here. Then, you may wish to submit the requested information here. P.S. As for post editing, because of prior abuse, new members are not permitted to edit their forum posts. Please post the protection log so that we can verify the item actually being blocked. Its possible that it's a false positive but we need more information to verify that. I didn't even know about BlockSite Plus. I'll check it out. Thank you for the tip. Hi Wolburg and thankyou for reporting this. Confirmed this is a false positive detection and we will get it fixed on the next update cycle. The detection will be fixed on the next update cycle today and should no longer be detected. @jayman1000 in regards to excluding a file, if you uncheck the file from the list of files to be removed and then click Next, MB3 will ask what you want to do with those files. One option is "ignore always" which adds it to the exclusion list. No this does not happen with the auto-quarantine. As I mentioned I have set Malwarebytes to warn me upon finding PUP's but still there is auto-quarantining happening. And in that quarantine list there is no option to select the items for exclusion; you can only chose to Restore the entries or Delete them. Restore just restores them, no option to exclude in the future. The exclusion option that you mention is only something that is available upon a scan. But when a program perceived as a PUP by Malwarebytes executes its files Malwarebytes seemingly detects it, Im guessing as part of the real-time protection process and quarantines it without asking or warning first. Dont believe I posted screenshot of my setting for auto-quarantining, but as you can see here, it should be disabled. Hi swanny2070 and welcome back to the Malwarebytes support forums. This time around the PUP.Optional is no longer a False Positive. On the 27thJuly 2018 Mozilla blacklisted the extension for the following reason -> "Violations of the data collection policies"
If Mozilla are blacklisting the extension then it would definitely be considered Potentially Unwanted Program.